Home » Campus News » Interfaith Understanding Through Joint Action: Cubalahh! Interfaith Understanding Through Joint Action: Cubalahh! 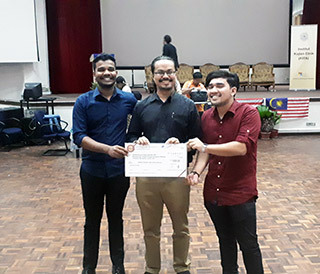 On the 16th of September 2017, the Institute of Ethnic Studies, National University of Malaysia, in cooperation with the Committee for the Promotion of Inter-Religious Understanding and Harmony Among Adherents (JKMPKA), Department of National Unity and Integration (JPNIN, Prime Minister’s Department) organized a forum and prize giving ceremony in conjunction with its annual event called; INTERFAITH UNDERSTANDING THROUGH JOINT ACTION: CUBALAHH! The objective of this event was to enhance the understanding and awareness of university students regarding the diversity of Malaysian citizens and to give them an opportunity to appreciate the diversity of religion in Malaysia and to cultivate creativity in terms of the representation of ideas through the use of multimedia. A total of eight videos were submitted in this event. The entries were from the National University of Malaysia (UKM) 5, International Medical University (IMU) 2, and one from Infrastructure University Kuala Lumpur (IUKL). Before the prize giving ceremony, Dr. Teo Lee Ken along with several panelists; En. Muhammad Helmy Abdul Gapar, Cik Phoon Li Juan @ Roovasini, En. Muhammad Nazmi bin Abd Halim and En. Danesh Mitharan Subramaniam took part in a forum that focused on the current religious issues in Malaysia. The forum started with a video that explored the psychological, emotional, behavioral and religious issues in a neighborhood in Malaysia. The participants of the forum were grouped into 4 groups and were asked to discuss the issue with their respective panelists before presenting their findings. After the forum ended, the prize giving ceremony was officiated by Prof. Dr. Ong Puay Liu as the organizer and the representative from JPNIN. A musical performance was held before the prize giving ceremony started. The winners took home RM1500, RM1200 and RM1000 for the 1st, 2nd and 3rd place respectively. The contestants from IUKL were students of Faculty of Arts, Communication and Education (FACE). Their participation in the competition has brought pride for IUKL. 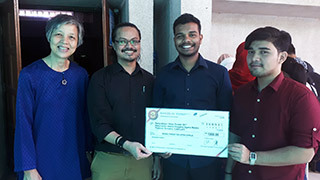 Congratulations to Mr. Mohd Hellis Mohd Som (Lecturer) and his student Muhammad Shahren Salehuddin (Project Manager) and his team for their effort and contributions to the competition.